The story is told of a nervous young man who once came before a selection panel for the Methodist ministry. During the interview, this rather shy young man took the opportunity of explaining that he was not gifted enough to set the River Thames on fire. One of the interviewers, Dr W E Sangster, responded with these words: “My dear young man, I’m not interested in knowing if you could set the Thames on fire. What I want to know is this: If I picked you up by the scruff of your neck and dropped you into the Thames, would it sizzle?” In short, what these interviewers were looking for, as of first importance, were not men of great learning and abilities but men set ablaze by the truth of God’s word. They wanted burdened preachers. That this is one of the crying needs of our times must be obvious to all who have the prosperity of the church militant at heart. There is no shortage of men going by the titles of Pastor, Reverend, Bishop, Evangelist, etc., for they are being churned out of our Bible colleges and seminaries like comic booklets off the press. Never in the history of the church have we had so many BAs, BThs, MAs, PhDs, etc., in our pulpits. Yet, we must equally admit that very few of these men would sizzle if dropped into the Thames. Professionalism is the order of the day. Men prepare their sermons with the same cold-bloodedness with which they prepared their college assignments, and are therefore quite content when in the place of an A+ they get a “Thank you, Pastor, for that wonderful sermon” at the end of the service. Obviously, something needs to be done to redress this situation, because no church can rise higher than its pulpit. The present prevalent deadness in the pew can be traced back to a lukewarmness in the pulpit. It is the lack of solid biblical conviction in the pulpit, which has begotten the almost total absence of decisiveness in the pews. If this be true, then all our efforts at restoring biblical Christianity in the pews will go to waste unless we remove the blight in the pulpit. If every Sunday, the opening of preachers’ mouths is like the opening of deep-freezers, then how can you expect the church to warm up to God’s bidding? We need to begin by asserting that simply giving out a text of Scripture, and then droning along monotonously on a religious subject related to it is not preaching—at least not in the biblical sense. Read the messages delivered by the prophets in the Old Testament and by the apostles in the New Testament and see if you do not feel animated. These men were gripped by the word of God and there is no mistaking it. They did not just know their subject; they felt it! To them, preaching was more than an attempt at the art of communication; it was an unburdening of themselves. They all knew something of a Jeremiah-like experience when that prophet said, “His word is in my heart like a fire, a fire shut up in my bones” (Jeremiah 20:9). Dr Martyn Lloyd-Jones notices this from the writings of the apostle Paul. He imagines someone saying, “If you have true scholarship you will not be animated; you will be dignified. You will read a great treatise quietly and without passion.” “Out of the question!” he retorts. “That is a quenching of the Spirit! The apostle Paul breaks some of the rules of grammar; he interrupts his own argument. It is because of the fire! We are so decorous, we are so controlled, we do everything with such decency and order that there is no life, there is no warmth, there is no power! But that is not New Testament Christianity.” (The Christian Warfare). If this “articulate snoring” (as Charles Haddon Spurgeon calls it) is not preaching, biblically speaking, then what is preaching? Allow me to quote Dr Lloyd-Jones again, who, in answer to this question, says, “Preaching is logic on fire! Eloquent reason! …It is theology on fire… Preaching is theology coming through a man who is on fire!” (Preaching and Preachers). And to this definition, we give a hearty Amen! This definition inevitably implies that the very truths we handle in the pulpit are calculated to develop the burden and passion in the preacher. A man talking about the weather may be forgiven if he sends half his hearers to sleep, but the preacher of the gospel handles issues of eternal life and death. How can we speak about the living God, the tragic fall of man, the glorious redemption in Christ, the omnipotent power of the Spirit, the blood-bought church of the Firstborn, the bliss of heaven and the torments of hell without so much as a tremor on our lips? It is the truth of God that made the prophets, the apostles, the reformers, and the evangelists to be the burning and shining lights they were. Yet it also needs to be stated with real emphasis that unless the Holy Spirit burns these truths into our being, we may know them but without feeling their awesomeness. Two preachers can preach sermons with excellent theology in them; from one it feels as if you are getting it out of the deep freezer, while from the other your heart is melted and you are stirred to the very depths of your being. I am persuaded that the difference lies in the study. To the first, the study is but a workshop in which sermons are assembled; to the other, the study is a womb in which sermons are conceived by the help of the Holy Spirit. The example of the great evangelist, George Whitefield, is worth noting. “Whitefield spent hours of each day on his knees with God’s word opened before him, and it was from the audience chamber of heaven he went forth to speak those marvellous words of power, which stirred the souls of the multitude. These eternal truths thus passed in him beyond mere intellections, they took possession of the whole man, and he could not but speak with tender pathos and holy boldness, as he saw light in God’s light, and the spiritual world was thus all ablaze with light around him” (Hezekiah Harvey’s The Pastor). If we are going to know the return of powerful, biblical preaching in our pulpits, we will need a reformation in those rooms we call our studies. We will need to learn to look at our studies as the place we go to meet with God to receive a word from him for his people. Therefore, we will need to go about our sermon preparations with a devotional spirit, poring over the sacred Scriptures “until the day dawns and the morning star rises in our hearts” (2 Peter 1:19). Yes, we must refuse to rise and go into the pulpit until the messenger and the message have become one, welded together by the Torch of God—the Holy Spirit. Then, and only then, shall we be burdened preachers concerned to proclaim “the burden of the Lord” to a sin-sick world. We must never look down upon ministerial training. Nor must we ever kid ourselves into believing that commentaries, concordances, lexicons, etc., are optional extras on which we can allow dust to accumulate. No, we must ever be grateful for all these tools. But let us ever remember the words of J W Alexander: “No man can be a great preacher without great feeling” (Thoughts on Preaching). Therefore, let us never stop at depending on our preparatory training and Bible helps. Rather, let us like Elijah of old turn to the Lord in prayer for that which he alone can give—fire from above. O that out of our studies may rise the prayer of Elijah, as I am sure it did in the days of the Reformation! “O Lord, God of Abraham, Isaac and Israel, let it be known today that you are God in Israel and that I am your servant and have done all these things at your command. Answer me, O Lord, answer me, so these people will know that you, O Lord, are God, and that you are turning their hearts back again” (1 Kings 18:36,37). Amen! Excellent. "Show me Your glory" is my constant prayer in the writing of my blog and sermons, so that I see Christ for myself - reconciling me in love with power. The glory of God, alone, produces that true worship that is gospel preaching and gospel living. Thank you for the blog sir. Soul stirring! Thank you so much Conrad for the article. It speaks of what has been lost in most Christian circles - the stirring of God within. 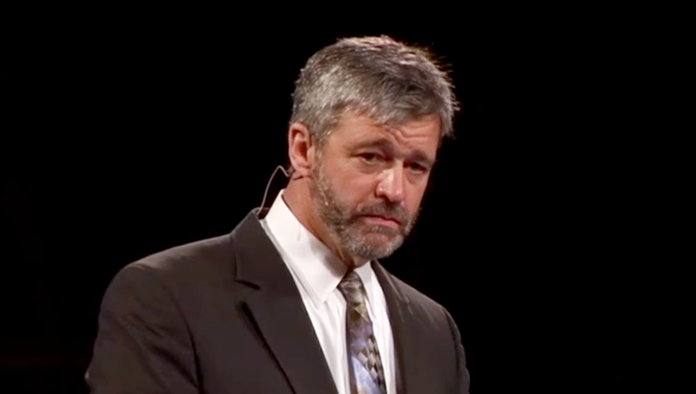 What is the relationship of Paul Washer's picture to the article though? As you will notice from my blog posts, I try to find a picture that best represents the subject I am handling. This was the best that I could find of a well-known preacher who looks burdened.